ArtsEmerson, Boston’s leading presenter of contemporary world theatre, is excited to announce the return of Manual Cinema with their production, The End of TV. 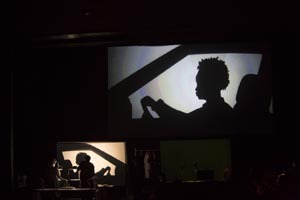 After thrilling Boston audiences with Ada/Ava in 2018, the ingenious artists of Manual Cinema cast a theatrical spell through live-action silhouettes, video feeds, overhead projection and a five-piece band performing an original score with their new creation. The End of TV runs just two weeks at the Emerson Paramount Center’s Robert J. Orchard Stage located at 559 Washington Street in downtown Boston. Set in a post-industrial Rust Belt city in the 1990s and told through a collection of original 70’s R&B-inspired art pop songs, The End of TV explores the quest to find meaning amongst the increasingly constant barrage of commercial images and advertising white-noise. The End of TV depicts the promise and decline of the American rust belt, through the stories of Flo and Louise, both residents of a fictional Midwestern city. Flo is an elderly white woman who was once a supervisor at the thriving local auto plant. Now succumbing to dementia, the memories of her life are tangled with television commercials and the “call now” demands of QVC. Louise, a young black woman laid off from her job when the same local auto plant closes, meets Flo when she takes a job as a Meals-on-Wheels driver. An unlikely relationship grows as Flo approaches the end of her life and Louise prepares for the invention of a new one. Their story is intercut with commercials and TV programs, the constant background of their environment. Tickets range from $20-$80 and can be purchased online at www.ArtsEmerson.org, by phone at 617.824.8400, or in person at the box office. Student, senior and group discounts are available. I knew this show would be different - but I had no idea what to expect. So glad I had the opportunity to see this. Really amazing to watch the whole production unfold before my eyes - it was like seeing the behind the scenes AS you are seeing the show. Remarkable. So innovative. It was funny, and touching, and revealed the simple core of the human spirit. It's definitely different. Loved the TV scenes - those were really funny. The use of overhead projectors and puppetry was amazing.